We are so proud of Pumpkin! 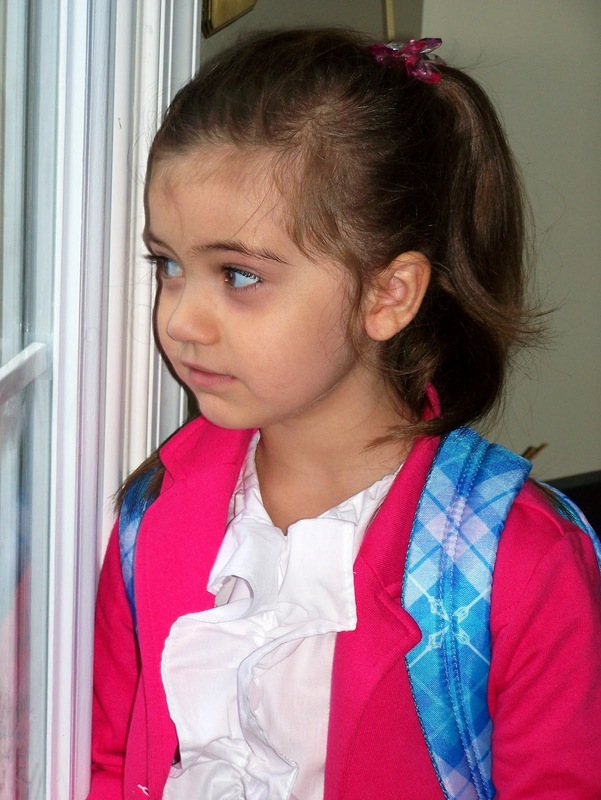 She is our first grandchild to start school. Her first day was Monday. She did very well. It is hard to be the first child to go to school. No siblings or cousins for support. Grandpa and I talked to her the evening before school and gave her a good pep talk. She was nervous as you can see in the pictures. Little sister Sweet Pea wanted to join her sister on the bus. She got her little heart broken. By now Pumpkins third day of school and she was happy and ready to see her new friends. 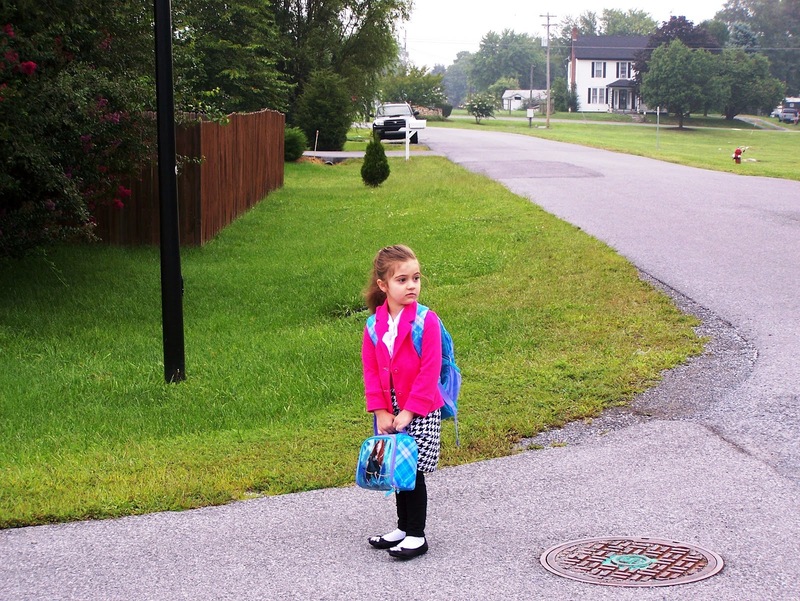 I totally remember my first day of school. The bus ride and the first time in the class room. I even remember my kindergarten teachers name. It was so long ago and terribly traumatizing that is why I remember it so clearly. I can remember being held on the bus screaming and kicking to get off. While my mother held onto my little sister who was screaming to get on the bus. I still remember my thoughts. Why not let my little sister take my place? She wanted on that scary bus so bad. 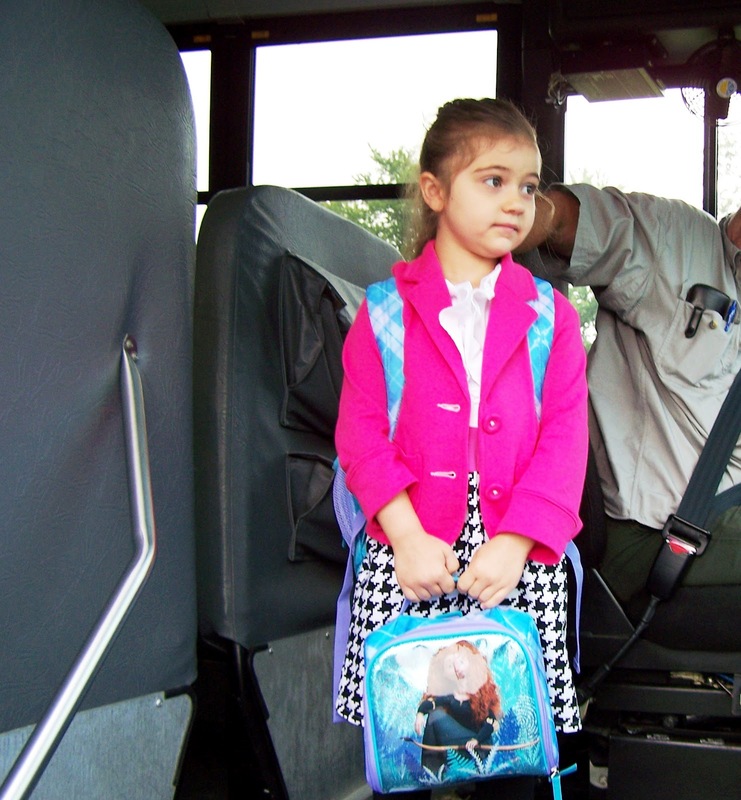 Do you remember your first day of school? i was scared of the bathroom in school. They made a big deal out of not touching the fire alarm thing and I had a nightmare that a dragon was in it. I sent my oldest to the big Kindergarten last year and will send my littlest next year. I remember my teachers name and the first day. I wasn't too scared to go to school because we only went 1/2 a day and my oldest sister went there already. 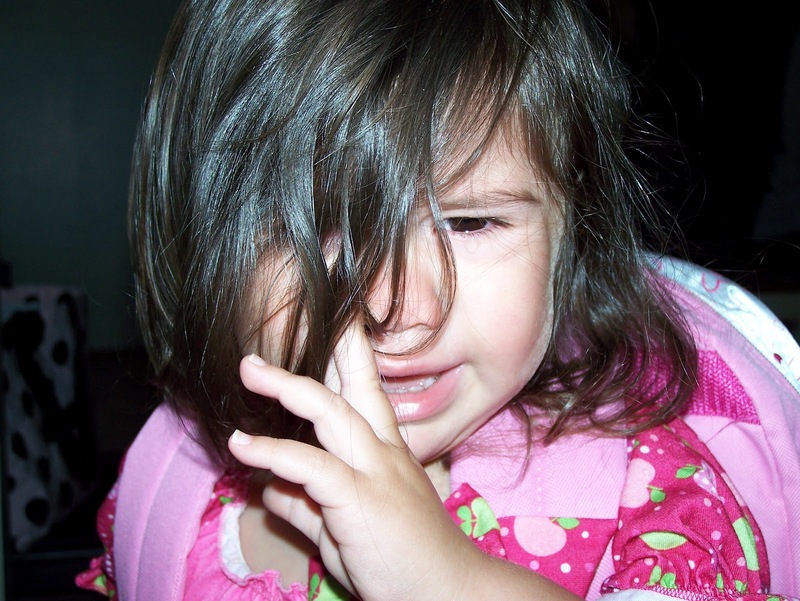 I remember being in tears when my mom forgot to meet me 1/2 way at lunch time. The paper boy walked me home. Then I scream cried and refused to go to school in 1st grade because we actually had to eat lunch there. I was so afraid I'd drop my lunch box. My mom had to call my dad to talk to me over the phone. What a big step for your grand daughter. I still have the photos of each of my kids first day of school. 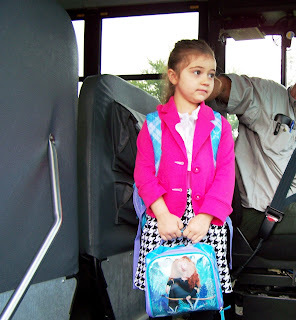 Abby couldn't wait to start preschool but I remember how scared Tyler was when he started. Kids are all so different. Abby jumps into everything with both feet, not all of the other grands do. 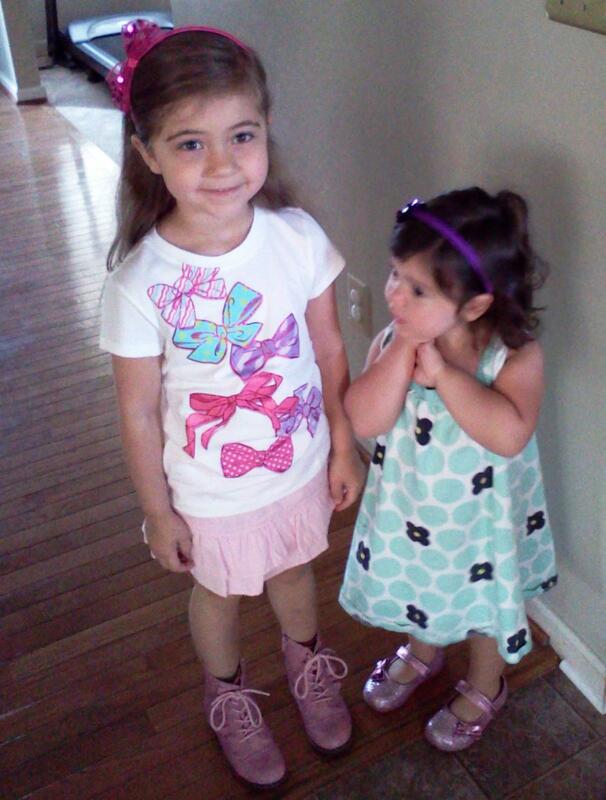 Your granddaughters are absolutely adorable. How fast they grow up, next thing you know she will be going off to college..
How cute both of your Granddaughters are.